I can say that I’m really proud of all young tech enthusiasts in Ethiopia nowadays that are eager to develop tech solutions out of their self-thought talent. I quoted that because I’m a kind of person interested on searching individuals who see this world differently. Specially, Africans who can show that they could also became an answer to our problems. All these talents are mostly in need of places where they can get a better working environment and knowledge. 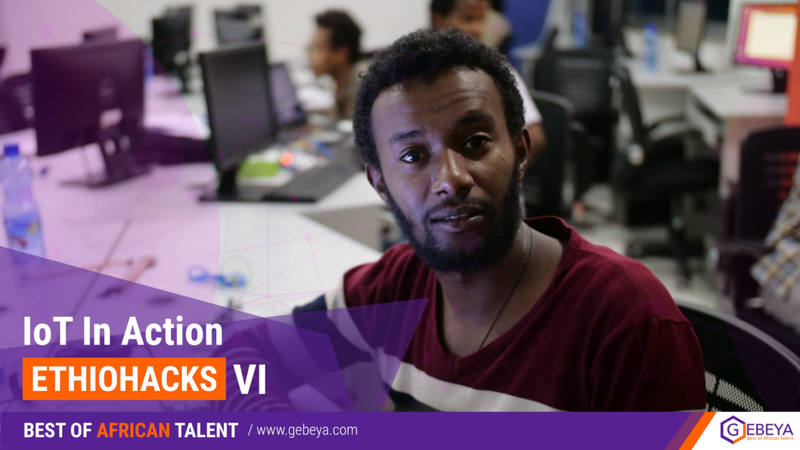 Out of less than 10 incubation centers in Addis Ababa, only few succeed on continuous support such as Organizing several hackathons, seminars, tours and meet-ups. 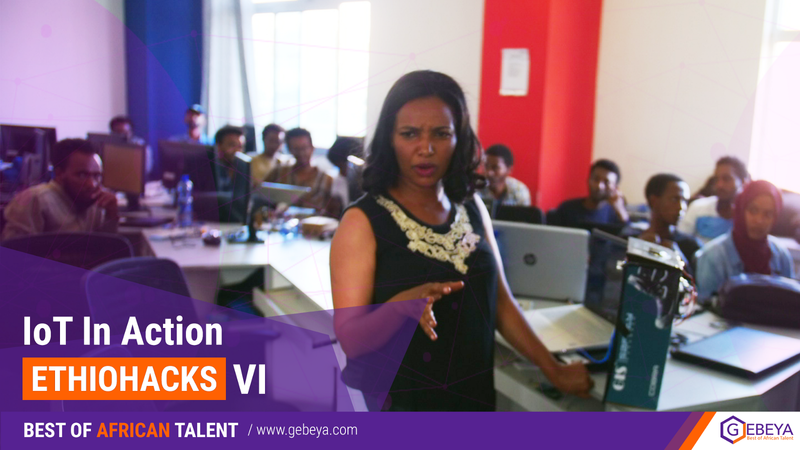 I believe the country still lacks to reach out for more innovators but places like Gebeya Talent are working towards identifying these talents by unlocking their potential through professional skill based training. 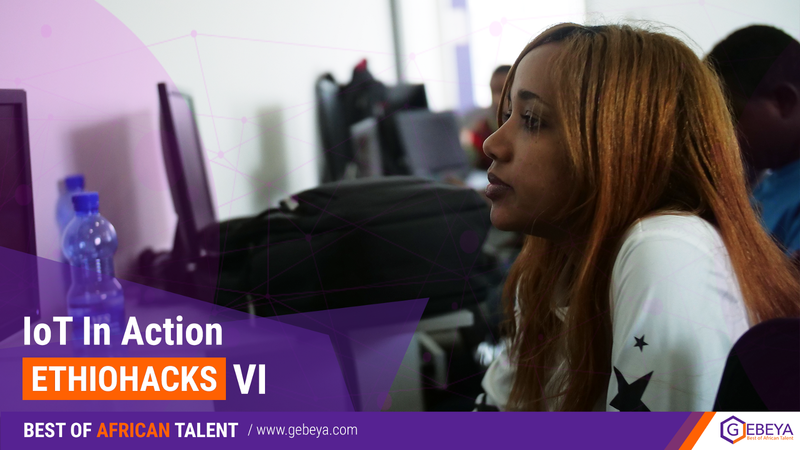 Out of all other the ways to join Gebeya Talent, hackathon is the one. I used to do weird hardware projects :) and spend time on disassembling electronic components to learn few things. I always question my self in case if I thought I missed the working principles of any device. This is of my behavior and ideas are known around my circle specially at Gebeya Talent. I had several discussions with the CEO and Co-Founder of Gebeya, Amadou Daffe on starting the first IoT training here in Addis. With the help of the Director of Training Mr.Teka Cherenet, an IoT curriculum were designed as per the country’s TVET standard incorporating latest trends of IoT development skills. Gebeya announced the opening of this training across most influential social media websites. It catches the attention of a lot of tech enthusiasts. I was also excited to give this training as a Trainer since I’ve been working on several micro-controller based projects such as VRider Gaming Controller, A Smart Waste-Bin (Blog) and FanosBox (Website). After we got the first batch, we successfully completed one month long practical training. 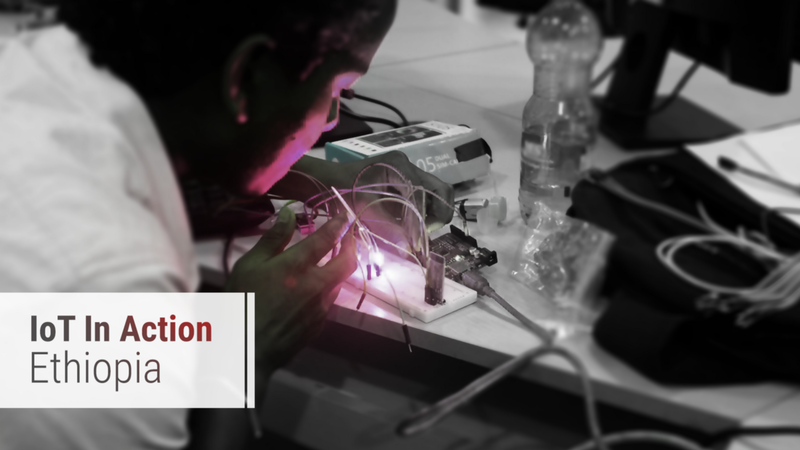 The training focuses on understanding how sensors used and electronic components work with famous micro-controllers. Obviously Arduino UNO R3 but most of our class were based on latest NodeMCU ESP8266 boards. After we get used to all basic hardware schematics, the next major part will be how these components send data to back-end systems (cloud API’s) via internet by using communication modules such as WiFi or GSM. Following the standard Internet of things decision framework and few of my personal methods on how I build things easily, trainees grasp most of the concepts with practical skill and able to showcase it. I enjoyed the time I had with first batch trainees. Ethiopia is one of the emerging African country and full of young peoples who strive to change their future. Among those, individuals who look for opportunities that’ll help them to reach out to their communities are a lot. Software developers, innovators and tech enthusiasts are the victim on getting required materials and funding. I know that there are different institutions on giving support but still limitation to resources specially on IoT area is tough. In order to practically build certain smart device, the developer should get the necessary skill following standard and should be able to get hardware resources to work with. In Ethiopia, finding these IoT modules, boards, wires and other related kits is unthinkable. Few guys started Telegram group and share what they have with the IoT developers who are needing it. Prices are expensive and it’s hard to cover it as student; Since most of them are in between high-school and university. Considering this limitation, Gebeya invested thousands of $ to cover the required materials for IoT beginners training. These helps trainees to practically experience the course and boost their interest to continue working on other personal projects of their own. As I’ve seen most of these IoT developers lose their interest in Ethiopia due to lack of availability of necessary IoT hardware items. 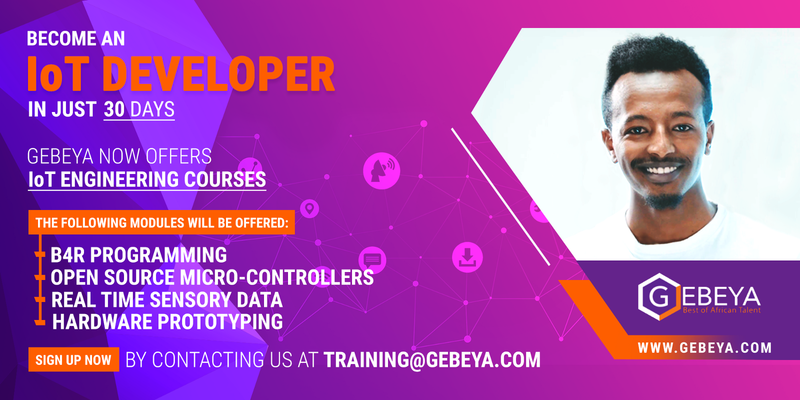 Gebeya covered both the training and materials at once and had successful IoT developers that now are capable of taking entry level projects. Also enabling them to master on their own. We believe we chose one of the powerful free tool from B4X called B4R. B4X is a suite of rapid application development IDEs that allows the creation of applications on the following platforms: Google Android, Apple iOS, Java, Raspberry Pi and Arduino. It is the next generation tool for connected world and I personally started using it now for almost more than 5 years. Then started training with B4R for IoT beginners class. I want to thank on all of B4X community for your kind support. For the 6th time, EthioHacks series back with the theme of Internet of Things / IOT in Action solutions. It was organized by Gebeya Talent and held from March 16–17, 2019. There were 100+ applicants subscribed on Eventbrite. 40+ attended the event and there were 13 innovative projects were submitted. The event also celebrates international Arduino Day 2019. 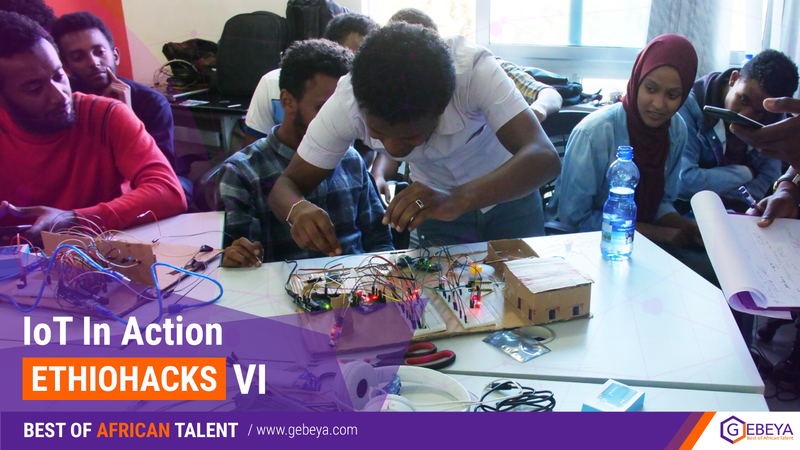 Gebeya Talent were one of the official event organizer among 659 international #ArduinoDay2019 event organizers. The event was complete success starting from the first day up to announcing the winners. Even if we got tired of 30+ hours of live event. Here of course, I want to thank Mr.Dawit Anbesu for his support before and during the event. He was following up everything inline with the event plan. Automatic PushUp Counter — Addisu Mekonen is among the first batch trainee on IoT for beginners class. He is a kind of person who asks everything if he thinks important to him. He made his first ever smart device that count Pushups. He invited his Architect friend that helped him on building the 3D concept design. Starting from the sketch up to firmware programming to final product casing, this project was among my favorite. He won 3rd place and using his skill that he got from the Gebeya Talent, I hope he’ll continue developing on other smart movable devices like this. Sherlocked — An innovative solution to control waste of drinkable water via a smart water faucet by my former university (Adama Science and Technology University) students. This reminds me on how water is wasted in most higher educational institution of Ethiopia and this team is looking for attention on helping them to reach out to all universities and deploy their solutions to minimize waste of this precious resource. Smart Irrigation System — By Eritrean Developers, I would like to say thanks to these people who share their skills and knowledge with us. This was the day we waited to be united all over again and create solutions for better Africa. Its my pleasure to have you all and Mr.Biniam Haddish (Team leader of the project). I hope all of you will join Gebeya Talent and specialize your skills. 1st Place Winner — Smart home Automation (Dawit from AASTU Student with his team). This team will get Gebeya’s professional track full scholarships. And finally we took a picture together and close this beautiful event. Thank you for all who joined and stand with us to share our vision for our community. 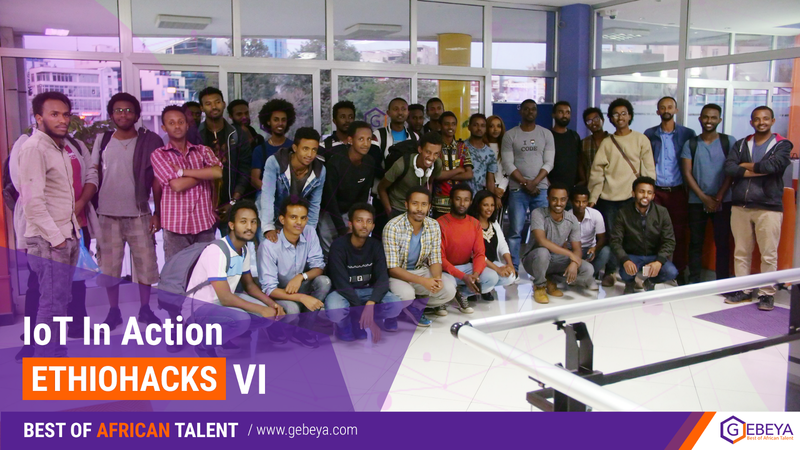 This was my experience on the first IoT in Action event held at Gebeya Talent. I wish all the challenges most of us faced will be resolved and grow the tech community. Written by — Daniel G.